Worldprofit’s Landing Page Builder – create eye-popping, beautiful, professional landing pages for any and all your programs. Website Management System – unlimited edits to your site, add pages, add code, etc. Custom Ebook Creator – quickly and easily create customized ebooks, graphics editor included. Prospect Manager – manage, organize, and contact all your leads and Associates. 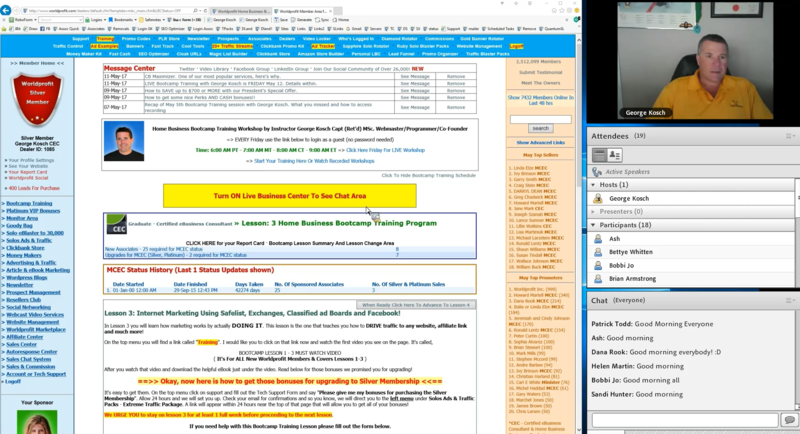 Monthly Traffic Injections: George demonstrated how Worldprofit Members can activate their monthly traffic injections. George reiterated that 80% of the software and resources in your Member area can be used to promote your OTHER programs, biz ops and affiliates. Demonstration: How to easily integrate your own Autoresponder into the Landing Pages. The next LIVE interative training day is Friday May 19th. See you then! George Kosch is co-founder of Worldprofit and has been in business online for over 23 years. Previous Article Worldprofit Bootcamp Update: Ready for you right now!